A fascinating inside view of the US Supreme Court. 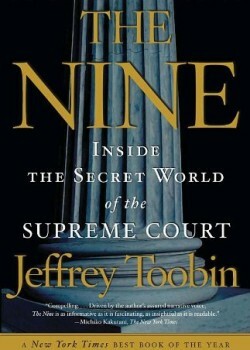 “The Nine – Inside the Secret World of the Supreme Court” provides a fascinating inside view of the United States Supreme Court during the later part of the Rehnquist era and early Roberts court. The book is written with the deft hand of an experienced author with a strong journalistic sense of drama. The book is especially strong in balancing an alternating focus on the personalities of the justices, on their ideology and work habits, and on the notable cases they decide, and then reverse—sometime within a dramatically short span of time. It demonstrates how political the court has become and how the Justices decide cases not “according to the law,” but by finding colorable legal reasoning in the law or the U.S. Constitution as a basis for reaching the result that fits their personal political views in a particular case. These supreme acrobatic fits of reasoning often come at a painful cost to precedential consistency, leaving the law vague, the judging process opaque, and the lawyers scratching their heads. While this theme might be exaggerated by the author for dramatic effect (and successfully so), the pendulum of Supreme Court decisions on abortions, racial and gender discrimination, affirmative action, state rights and executive powers could be the seed of the institution’s ultimate demise and its eventual replacement with an elected body of judges who will decide cases along party lines without the need for legal wizardry of pulling political levers behind the pomp of red curtains and black robes. While Toobin’s own politics occasionally sprouts like weeds between concrete pavers (or like wildflowers between blocks of marble, depending on one’s political point of view), and while the portrayals of some of the justices are at times simplistic and border on caricature (especially and unfairly those of Justice Scalia and Justice Thomas), these shortcomings are ably compensated by sensitivity and humor, as well as a convincing linkage between the various ‘mini-biographies’ and the detailed descriptions of the daily work of the court and its members, who wield great powers in directly influencing every facet of American life. Unlike the Congress and the Administration, the third branch of our constitutional form of government—The Supreme Court—is neither elected by the people, nor accountable to the voters. The Justices are appointed for life, conduct their work in complete secrecy, and their published decisions often impact many successive generations. Books like The Nine, therefore, are doubly important and valuable. From a reader’s perspective, this is a page-turner for anyone interested in law and politics. Surely, lawyers will find the stories and cases irresistibly interesting, but this book would be approachable and enjoyable for all readers, notwithstanding one’s level of education or profession. In conclusion, Toobin’s The Nine serves in equal measures as a cautionary tale and a tribute to the institution and its members. It is the natural sequel to ‘The Brethren’ by Woodward and Armstrong, yet it is written for today’s readers, peppered with hearty anecdotes and contemporary figures of great color and relevance. I highly recommend it.